Originally released by Musical Freedom, the instrumental edit of 19-year-old Oliver Heldens’ deep house track ‘Gecko’ has become a popular track in club sets for 2014, peaking at #2 in the Beatport chart and garnering support from the likes of Pete Tong, Danny Howard and Zane Lowe. The latest edit ‘Gecko (Overdrive)’, written and vocalled by Becky Hill during a late night recording session with MNEK, is being released by Parlophone’s new dance imprint FFRR. Initially written for another vocalist, Becky’s vocal on Gecko’s chorus was deemed the perfect fit and has already been coined the ‘Hottest Record in the World’ by Zane Lowe. Signed to Spinnin’ Records when he was just 17-years-old, the Netherlands-born DJ/producer has also released the tracks ‘Stinger’ and ‘Juggernaut’ as well as creating remixes for Martin Garrix. Oliver’s recent schedule included sets at Miami Winter Music Conference where he played sets at the Spinnin’ Sessions, the All Gone Pete Tong Pool Party and Tiesto’s Musical Freedom Party. His biggest UK set to date will come at this year’s Creamfields, where he’ll play the Departures arena. He recently supported Avicii at two huge arena dates in Belgium and the Netherlands. After writing and singing the toplines for Rudimental’s ‘Powerless’ and Wilkinson’s D&B track ‘Afterglow’ last year, Becky Hill has been in demand. She has also been writing and recording with a host of producers and musicians, gathering material for her upcoming album, released later this year on Parlophone Records. 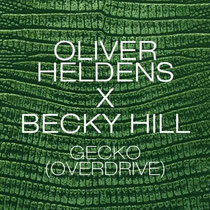 'Gecko (Overdrive)' is out 23 June, check it out below.